The Knysna Forest is world famous for its beauty, dark recesses and giant Outeniqua Yellowwoods, some of which are almost a thousand years old. It has achieved a mythical and permanent place in South African literature through the works of novelist Dalene Matthee, who has found inspiration for numerous novels in the heart of the forest. The Knysna forest comprises subtropical moist broadleaf trees and covers an area of about 300 000 hectares in South Africa’s Eastern Cape and Western Cape provinces. These forests are home to no less than five mammal species listed in the South African Red Data Book. These are the tree hyrax (Dendrohyrax arboreus), samango monkey (Cercopithecus mitis), blue duiker (Cephalophus monticola), giant golden mole (Chrysopalax trevelyani) and honey badger (Mellivora capensis). The long-tailed forest shrew (Myosorex longicaudatus) occur just about only in this region. The legendary Knysna elephant (Loxodonta Africana) must be the undisputed champion of this park. Until recently, these last free roaming forest elephants in South Africa were thought to be extinct, but recent studies show there may be as many as four or five elephants left in the forest. These elusive ghost-like creatures are seen only on very rare occasions and are the only remaining survivors of herds that numbered in their hundreds at the end of the 18th century. 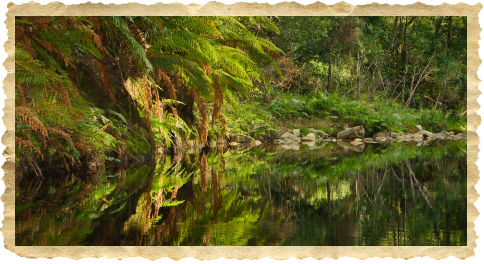 Almost all of the remaining forest are protected by and encapsulated within the Garden Route National Park, offering a wide range of accommodation options ranging from 4-star forest chalets to unique timber camping decks right within the forest itself. A truly unique aspect of this park is that it offers various outdoor activities like canoeing, boat trips and spectacular hiking and mountain biking right within the forest itself, allowing the visitor the rare perspective of being an active park explorer, rather than a passive spectator from a closed vehicle. Millwood House is typical of many which were built in the 1880’s in the little mining village of Millwood in the forest, about 27km from Knysna. The house was transported in sections from Millwood to the current site and it is one of the few of its type which still remains. A group of local ladies was instrumental in converting the house to a museum in August 1972, and it was declared a National Monument in 1977. 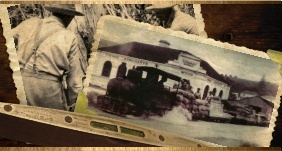 Now under the control of Knysna Municipality, this is where Knysna’s history comes alive. The collection includes a photographic display of the Millwood Goldfields, local transport, early street scenes, personalities, shipping, etc. and a few personal possessions of George Rex, founder of Knysna. The Knysna forest has been exploited for valuable timber since the 18th century, and the Amatole forests since the 20th century. Currently the forests are mostly within protected areas, although a certain amount of managed timber harvesting is allowed. Attention first fell on the rich timber of this area as the Dutch East India Company settlement at the Cape grew in leaps and bounds and gradually used up the available timber close by. The fine timber resource was seriously diminished and the local forests inevitably reduced for fuel, building requirements, heating, wagon and boat building as well as a demand from occasional ships which called in. New sources of wood were hard to find. In 1778 Governor Van Plettenberg travelled eastwards with an entourage to what became Plettenberg Bay. Soon a woodcutter’s post with a timber shed was built for storing timber before shipping it to Cape Town. The first cargo left on the sailing ship Meermin under the command of Francois Duminy in 1788.
to settlers at the port of Knysna. 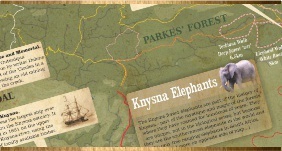 In the 1890’s the Knysna district depended upon its forest industry for it produced little else. The main exports in the early days were wagon wood and planks that were cut in the forest by means of a pit-saw. 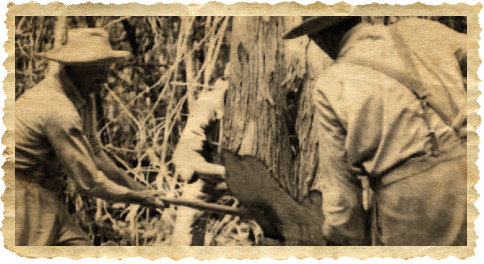 A log was placed across the saw pit or deep trenches where one man stood underneath and another on top of the log, using a long two- handled saw, sawing perpendicular. Some of the first turned articles to be manufactured were broom and shovel handles which were produced in 1892 by George Parkes at his saw-mill, The Knysna Forest Company, by a machine imported from Ohio. Then followed the manufacturing of chair and table legs that were sold in sets to be assembled at their destination, thus saving package in transit. During the Depression in the 1880s, the timber industry suffered until the contract for Yellowwood railway sleepers was awarded to Messrs Fox Dunn & Co. This led to the building of the Government Jetty on Paarden Island (Thesen Island), to be followed by the government Creosote works where the sleepers were dipped for preservation. George Parkes pioneered the export of Boxwood to Britain to be used for the making of shuttles in the weaving industry. Other timber manufacturers soon followed suit. 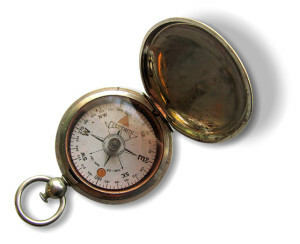 After World War 1 the main exports were sawn timber, handles and wagon wood, followed by the making of furniture for which Knysna became renowned. Knysna’s handcrafted furniture was made by several firms, such as Thesen & Company, Geo Parkes and Sons, JH Templeman, PG Johnstone, Jonker Bros, Fechters, Kluyts and PJ van Reenen. Parkes Forest is the name given to the indigenous forest area owned by Geo Parkes & Sons (Pty) Ltd from which they supply the wood to most of the establishments on the Timber Route. In 1974 the Minister of Forestry proclaimed the forest as protected under the Forest Act (Act No .72 of 1968) by Government Notice NO.1296 of 26 July 1974. The implication of this Act is that no tree can be harvested without a harvest permit from the Department of Forestry. Parkes Forest is no exception – no harvesting is done until the Department of Forestry has inspected the trees and a harvest permit has been granted. tree harvest selection criteria to be adhered to and trees are specifically identified for topping or felling based on various observations such as crown dieback, loss of the main shoot, basal rot or stem rot and natural factors such as windfall. 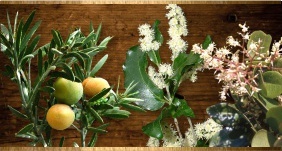 Marketable species include: Yellowwood, Stinkwood and Hard Pear, with a minimum diameter of 40cm. Cut lines from bio-degradable tape are made through the undergrowth, dividing the compartments into strips 15 to 20 metres apart. The colour of the tape (blue for topping, yellow for felling) indicates the prognosis of the tree involved. FSCTM is an independent, non-governmental, not-for-profit organization established to promote the responsible management of the world’s forests. Natural forests throughout the world are threatened by global demand for forest products which will not only continue, but also accelerate. Much of the world’s remaining natural forests still suffer from illegal exploitation, poor management and conversion to other land uses, commonly resulting in severe degradation or complete destruction. It was these very concerns that led to the establishment of FSCTM in 1993. At the heart of the Knysna Forest you’ll find the Deep Walls section of the Garden Route National Park which is home to the Forest Legends Museum. This museum reveals some of the forest’s best kept secrets, with beautiful exhibits on everything from Biology to history.